The Maroondah Rugby Union Football Club are associated with the Melbourne Rebels Super Rugby Team. 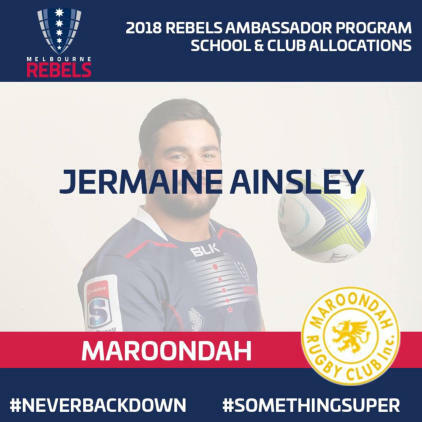 We have been appointed Jermaine Ainsley, of the Rebels, as our Club Ambassador for the next 3 years. We look forward to working closely with the Melbourne Rebels to continue growing a passion for Rugby Union in Victoria. Rugby Victoria (Formerly known as the Victorian Rugby Union – VRU) is the governing body for Rugby Union within the state of Victoria. The governance of Rugby Union is Victoria is underpinned by the following values: 1. Make Rugby a game for all. 2. Ignite Victoria’s passion for the game. 3. Build sustainable elite success. 4. Create excellence in how the game is run. Maroondah Rugby Club continues our association with Rugby Victoria into the 2019 season.